This car, sometimes listed as the "Maya Exotic" Lamborghini Gallardo Superleggerra, is a low-cost 1/18th scale toy, about 9.5" long. It has a nicely detailed, very scale-looking body that sets it apart from other cars in this class. The windows are completely blacked out, so there's no interior to see, but you can see an engine under a clear cover. The plastic the car is made of is pretty thick and the car is heavier than I expected it to be. The controller is appropriately small for younger hands, but it does feel a little cheap and the sticks make a clicking sound when you use them. On the road, I was immediately very satisfied with the performance of the car for its size, price, and target age. It zips around pretty at a respectable speed and gets to that speed quickly. Steering responds quickly to the controls and the turning radius is appropriate. The car has no suspension and its tires are very firm, so it does tend to bounce around a bit over bumps, but it's not enough to make it awkward or difficult to control. On a smooth surface, whether indoors or out, it looks very scale-realistic with its ground-hugging stance. 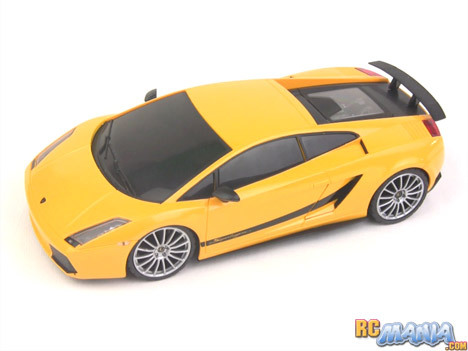 This Maya Exotics 1/18th Lamborghini Gallardo Superlegerra by XQ is a good-looking, fun toy with a reasonable price tag. As an unexpected little bonus, if you happen to collect 1/18th scale diecast display models, this car will fit right in when it's not in use!